In the latest report– ‘World in 2050’ published by PWC, a professional services organization; projected economic growth for 32 of the largest economies would account for 84% of global GDP. Although PWC predicts a slowdown in the growth rate of the global economy after 2020 (as a result of moderate growth and also the aging of the working population in China and other major rising economies), the world economic growth is projected to be around 3% per annum from 2014 to 2015. The global economy will double in size by 2037 and nearly tripling by 2050. The global economic power will shift from the current superpowers like USA, EU countries and Japan to China and India. However, this shift will take around 35 years, i.e. such transition will end by 2050. China has already overtaken USA in terms of GDP in 2014 through purchasing power parity (PPP), and the country is expected to become the top nation in terms of market exchange rate (MER) by 2028. India is on its way to become the second greatest economy in the world in terms of GDP at PPP and the third in terms of MER. Indonesia will be fourth and Brazil will be fifth. In the next 35 years the most advanced economies, being the most mature in all aspects, are likely to grow at the slowest rate while the emerging ones are likely to increase at the highest rate. The emerging economies are likely to experience superior gain in PPP. However, the gain will be distributed among a large population, and the GDP per capita will still be significantly higher for the developed economies, which arises mainly from their smaller population and high MER. We are likely to see a more uneven distribution of global GDP, and an average person in one of the top three countries may have 3-40 times more GDP allocated to him than a person in the next 30. 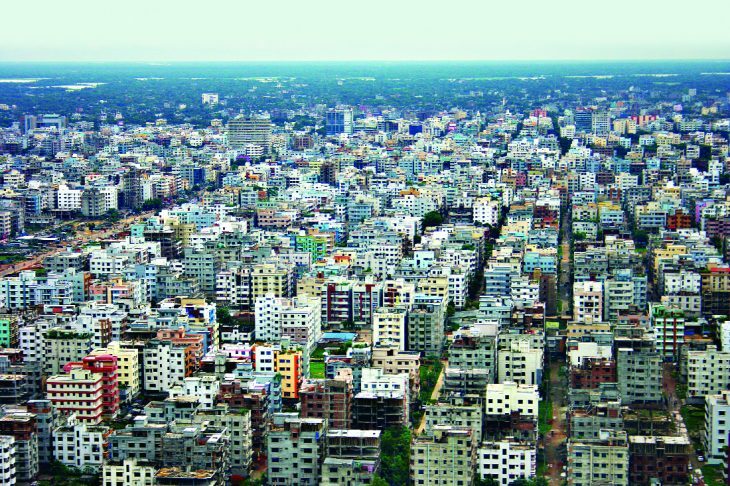 Currently, Bangladesh has a GDP at PPP of USD 536 billion, and is ranked as the 31st country in such list. According to PwC’s predictions, by 2030 we would climb 2 more positions, and by 2050 we would be the 23rd country in terms of GDP at PPP with a value of USD 3367 billion, an increase of 5.28 times from the value in 2014. Even at MER our projected GDP would be USD 2,450 billion. In the next 35 years, our population is predicted to grow by 0.7% p.a., real growth per capita by 4.4% and average GDP growth (in terms of domestic currency) is expected to be around 5.1%. But why exactly would our country progress 8 steps in the ranking? As production costs rise in the countries like China more jobs are likely to flow into Bangladesh, Vietnam, etc. where the costs are lower and will be so for the foreseeable future. We are the 8th largest country in terms of working age population growth estimates from 2014-2050, which means our workforce will not dwindle anytime soon, and the large workforce will keep wages low when compared to Chinese or Brazilian standards. The favorable conditions will attract a lot of domestic and foreign investment, and investment may grow from 21.2% of the GDP now to 23.2% of the GDP in 2025. Now the question is if we can actually rise to be 23rd largest economy in the world by 2050. The PwC report is more of a projection than a prediction, and it shows what will happen if current trends continue accounting for some of the future disruptions. The PwC identified four key factors behind the growth: growing labor force of working age, increase in human capital, growth in physical capital and factor productivity. Our labor force is estimated to grow for the foreseeable future. Our human capital is increasing – more educational institutions and training centers are being set up, and more educated people versed in both academic and technical knowledge are entering the workforce. The entrepreneurs are becoming more aware of the need of the latest equipment to maintain and improve their productivity and competitiveness in terms of product quality and price and also in terms of delivery speed. More efficient production methods and higher skills will ensure increase in factor productivity. Even though it is highly likely that we would improve vastly on all four of these fronts, external factors can play negative roles and act as impediments to our growth. Dr. Zahid Hussain, lead economist at Dhaka office of the World Bank, however, termed the projection on Bangladesh ‘not a realistic’ one. Our institutional capacity is currently low, there is lack of governance, the current policies and political environment are not investment friendly. The institutions required to promote the growth projected by PwC are still developing. The growth rate of over 7.0% that we must continue to achieve in the next 35 years to become the 23rd largest economy will be very difficult to achieve if the above mentioned problems are not tackled. And considering Bangladesh’s history of development, turning the projection into a reality would be difficult but nonetheless achievable.